Hey there! This card is for the Splitcoaststampers Creative Crew inspiration challenge for June. This is my favorite of my five projects that I made for the Crew this month! For the inspiration challenge this month, I was inspired by this bold fuchsia flower with gold and green accents. 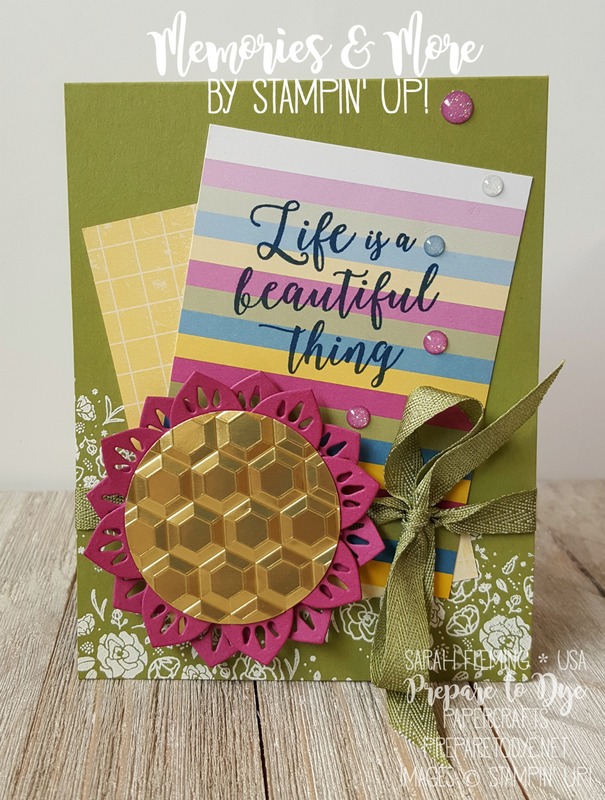 I started with an Old Olive card base and stamped and embossed the flower spray from Wood Words in white on the card base. I stamped it three times. LOVE this look! The two 3″x4″ pieces of DSP on top of the embossed card base are not DSP at all. They are pocket cards from our new memory keeping collection, Memories and More. I absolutely adore the Color Theory M&M collection (sorry, I’m going to call it M&M and sometimes maybe even Eminem). I tied the ribbon around the card base — this is the super soft 3/8″ Mini Chevron Ribbon, and it comes in Bermuda Bay, Crushed Curry, and Old Olive. It is the easiest ribbon to tie into a beautiful bow! And did I mention how soft it is? It’s kitty soft, and I know this because I sometimes pet it. *side eye* Look at the drape on this ribbon! I used the Eastern Medallions Thinlits to recreate the big, bursting flower. 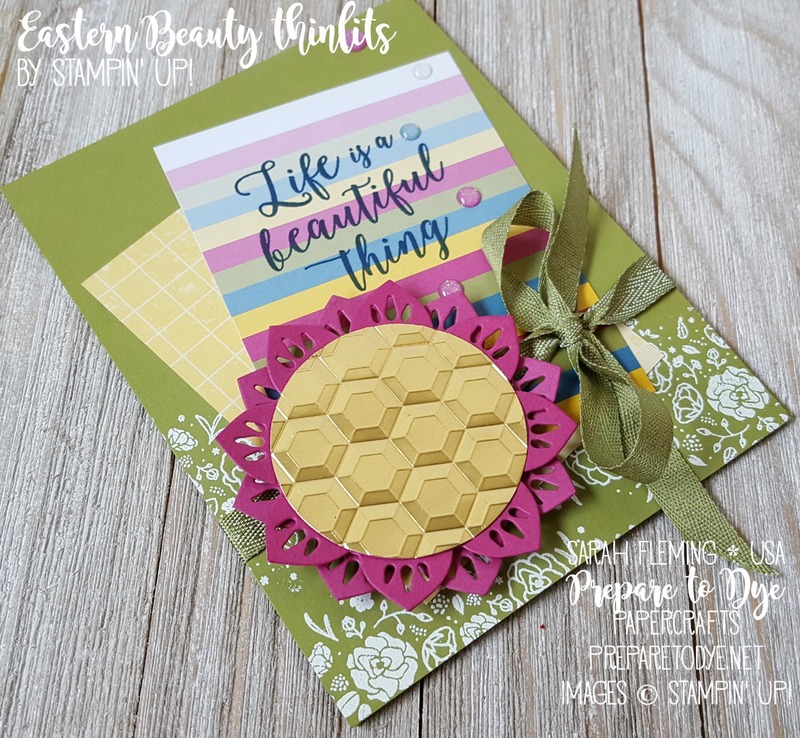 I punched a piece of Gold Foil out with the 2″ Circle punch, then embossed the Gold Foil with the Hexagons folder (this matches the decoration on the inside of the card as well). 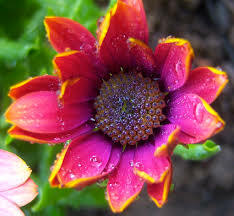 I put Dimensionals between all the layers and under the flower. And lookit those Glitter Enamel Dots. You can order them today. I chose the “Life is a beautiful thing” sentiment, because it just seemed perfect for both our theme (Promises of New Things) and this vibrant flower. 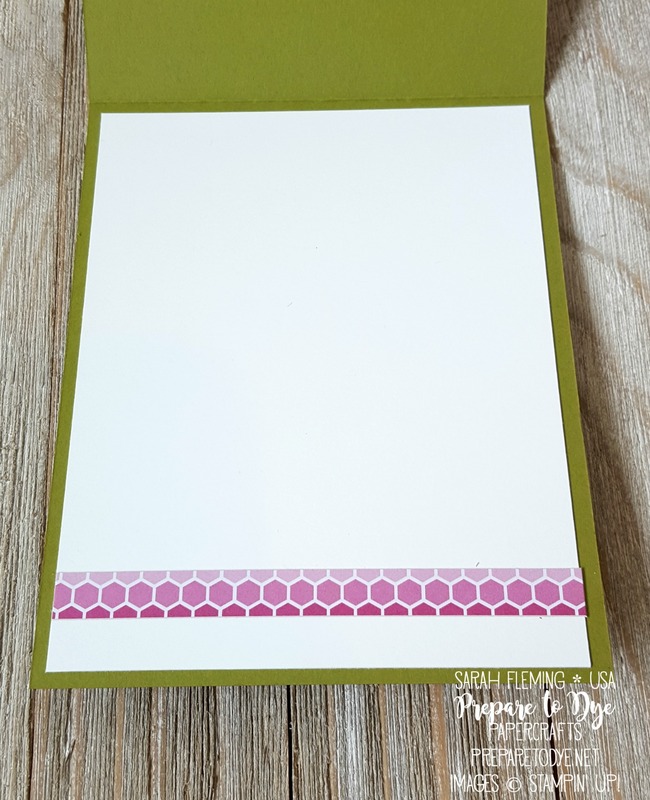 I lined the inside of the card with some Whisper White cardstock and added a sticker from the M&M card pack to coordinate with the hexagons embossed on the front of the card. In addition to the following items, I used the Eastern Medallions thinlits for the flower. The item # is 143725.